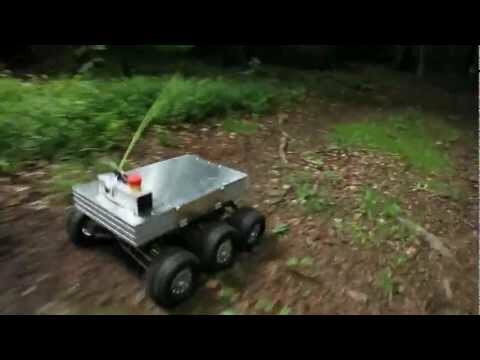 This is the TOUGHBOT Robotic Platform. The TOUGHBOT is a small, lightweight, affordable robot designed for surveillance, reconnaissance and inspection. The TOUGHBOT is a ruggedized platform with an infra red camera, a water resistant shell and the ability to turn on a dime. It is designed for multiple applications such as Law Enforcement, Engineering and Building Inspection. Completely Mobile- No AC required. This is a stable and reliable system. It includes a low lux Camera. With its high powered transmitter and receiver you can see where you can’t see. This is a Teleoperated FPV UGV. First Person View, Unmanned Ground Vehicle. You control it as if you were inside the vehicle itself. Drop it into a hazardous environment and record the video as you look up, down, left, right and everywhere in-between while driving, while sitting in a safe comfortable location! Low Profile -Perfect for Under Vehicle Inspection. Completely Mobile: no AC required.